I was first made aware of Goose Barnacles back in 2009 through this somewhat alarmist article published in the Daily Mail: "The Revolting Dr Who monster that terrified tourists". As a headline it's hard to beat but the creature that washed ashore in Oxwich Bay that day was even curiouser still. 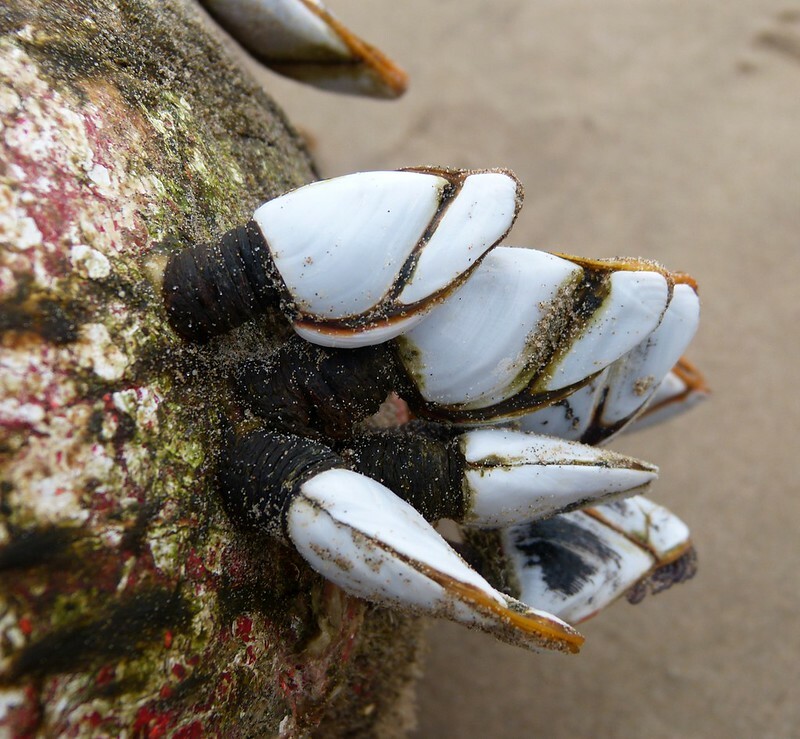 What people had in fact stumbled across was a colony of Goose Barnacles, more typically associated with deep water though occasionally washed ashore following stormy weather. We've certainly had plenty of that lately and it's perhaps no surprise that our walk along Cefn Sidan at the weekend found two separate clumps of these natural wonders clinging to flotsam. 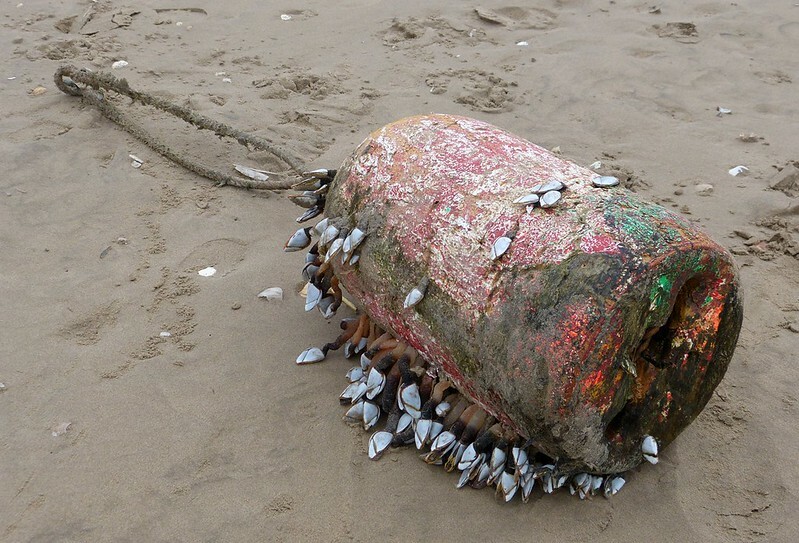 The buoy above represented the largest grouping though sadly we were too late to see the writhing mass reported in the press. These were most definitely ex-barnacles. Even so their fascinating structure was clear to see with long stalks topped by a structure remarkably similar to that of a Puffins beak. 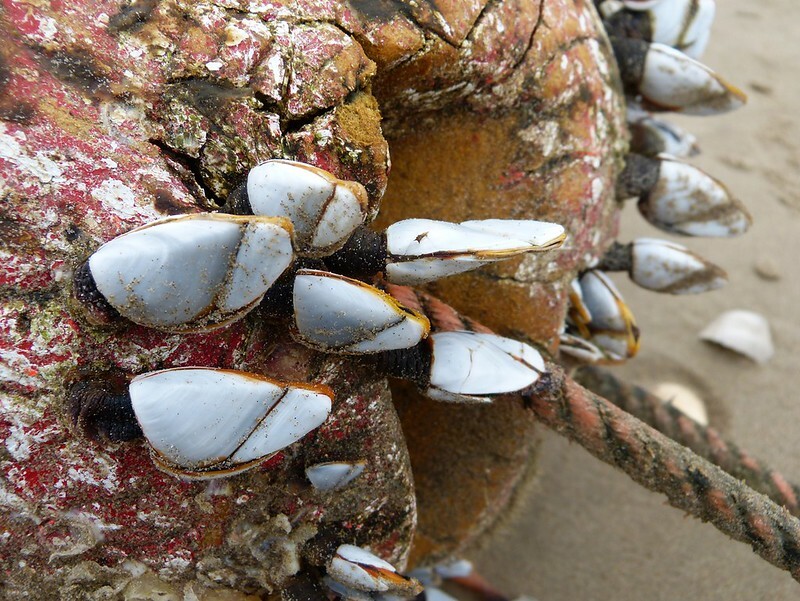 Out in open water the Barnacles feed by by moving those 'tentacles' around in an effort to catch plankton brought towards them on ocean currents, and as a result are often found on exposed coastlines. Unfortunately that choice of habitat was probably the downfall of these individuals though at least it gave us an excellent opportunity to study a rare visitor to our shores. 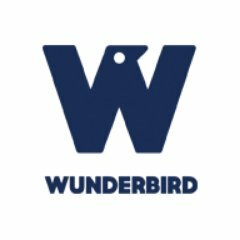 “these birds are not flesh nor being born of the flesh for they are born at first like pieces of gum on logs of timber washed by the waves. Then enclosed in shells of a free form they hang by their beaks as if from the moss clinging to the wood and so at length in process of time obtaining a sure covering of feathers, they either dive off into the waters or fly away into free air. . . I have myself seen many times with my own eyes more than a thousand minute corpuscles of this kind of bird hanging to one log on the shore of the sea, enclosed in shells and already formed”.